u-he Podolski: it's free, so why wouldn't you? 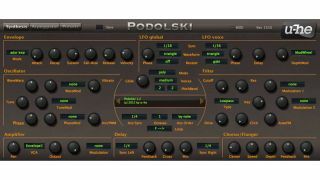 Following yesterday's free NI distortion/filter plug-in Driver we have news of another giveaway today in the form of u-he's Podolski mini synthesizer. There's also an arpeggiator/sequencer that's similar to the one in u-he's Zebra synth plus chorus and delay effects. Other features include the Click parameter, which emphasises the filter attack, and the ability to warp between three waveforms via the WaveWarp option. Download u-he Podolski now at the u-he website.